You probably see people who always seem happy. They greet each day with a smile. They see the bright side of any situation. They believe that people are inherently good. I have always considered myself one of those people. And I still am that person but have a few things that are nagging at me and making my outlook not so good. What makes a person happy ? What makes me happy? How can I help others be happy? And what is happiness, really? I kept reading over and over that happiness is something you have to work at and keep at and develop the habits that truly make people happy. 1. Know happiness isn’t based on a social status, a job or even your health. These things account for only 10% in people’s differences in happiness, experts say. 2. Believe that ultimately everything happens for a reason. Acceptance leads the way to happiness. 3. Happy people realize life is a balancing act between holding on and letting go – and they’re comfortable releasing things that no longer serve them. 4. Don’t worry about what other people think. They do their best to cultivate self – confidence. 5. Don’t blame genetics. Only 50% of our happiness is linked to our genes. 6. About 40% of our happiness is based on intentional behavior. PEOPLE THAT ARE NOT HAPPY WITH THEMSELVES, CANNOT POSSIBLY BE HAPPY WITH ME. Wow !!!!! 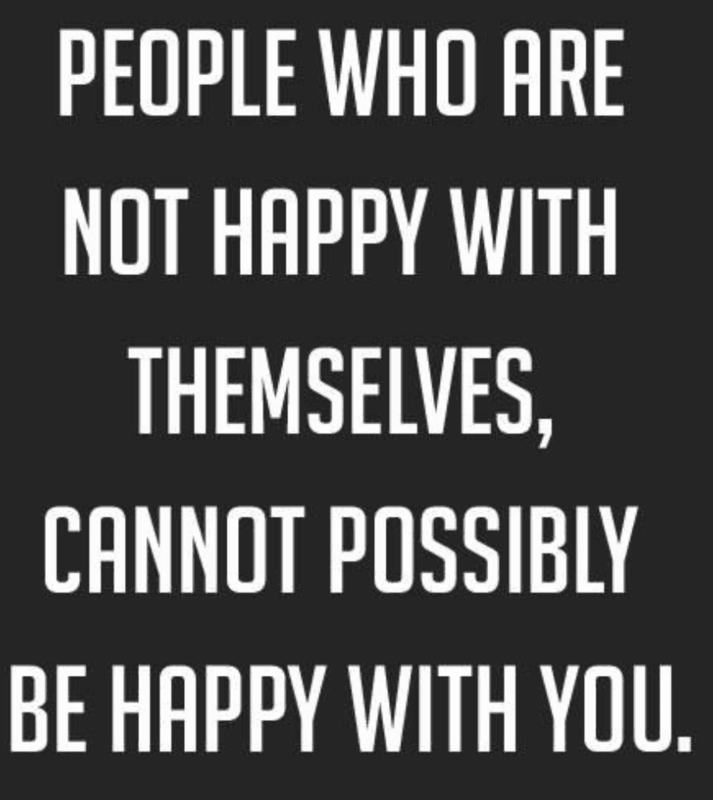 No kidding no matter what you do or how good you are or how you feel about anything if that person is not happy with themselves how can I possibly think that anything I could do would make them happy !!! It can’t !! This speaks volumes for me and now if I can get this tattooed on ever pair of sunglasses I own I can remember this and not to beat my self up every time someone thinks I fall short. This one think will keep me on my happy track and i can continue on practicing my happy habits. I may not have a lot of money and I did not go to Harvard but my quality of life is abundant. Facts and studies prove that millionaires are only 3% happier than the working class where money is involved. Wow what does that say ??? Don’t work your life away ?? When people think of me I want people to think I’m happy, positive and not a Debbie Downer !